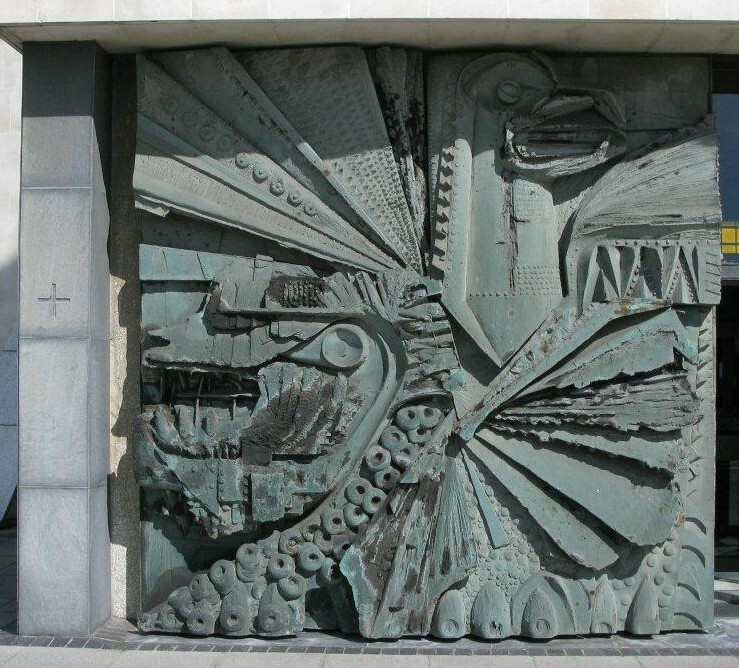 Back in April, I wrote about a trip to Liverpool and my discovery of the work of the brilliant sculptor William Mitchell. Well, as I suggested at the end of that post, I haven’t been able to get his powerful work out of my head, and after some rooting around the internet and a couple of email responses to my earlier post, one to my utter amazement from the artist himself, and another advising that a piece of his work had recently been reinstalled into Kirkby Library in Liverpool, I’ve decided to write another, more detailed and dedicated post on one of our most underrated and unsung post war sculptors. William George Mitchell was born in London’s Maida Vale in 1925. After a childhood plagued by illness and missed schooling, he was apprenticed to a local firm of decorators, where he began to learn about materials and craft. 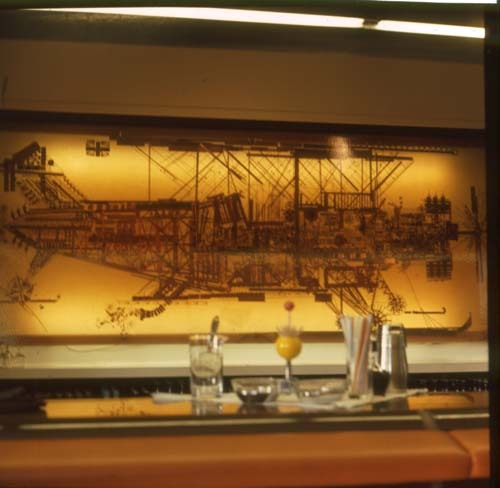 The advent of WWII resulted in a stint in the Royal Navy after which he ended up working for the NAAFI (effectively the catering and retail arm of the Armed Forces) where he was responsible for creating painted murals and panoramas on the walls of refurbished club and canteen buildings, at many sites across the globe. 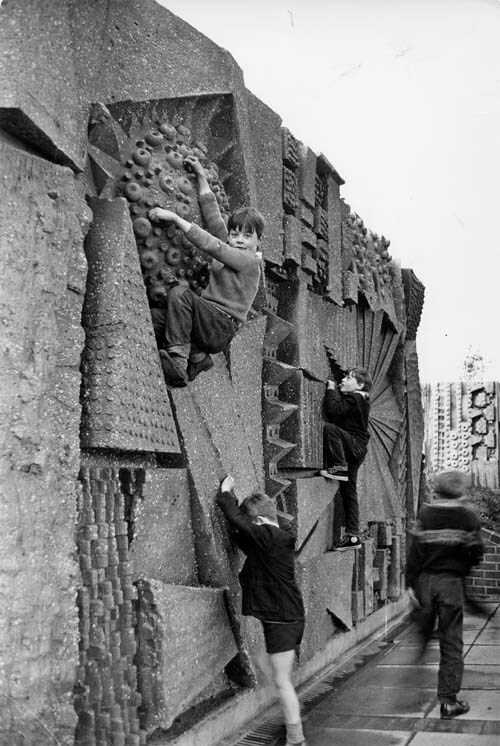 Mitchell finally began to make a name for himself after joining the London County Council Architects Department in the late 1950’s, designing decorative works for the many new Post War Council Estates that were at that time springing up throughout London. For me, one of the strength’s of Mitchell’s work was his seemingly unquenchable desire to experiment, and a quick look through his own website, throws up a huge range of materials, styles, processes and techniques which, when combined with his sharp eye for pattern and narrative, resulted in some truly wondrous things. 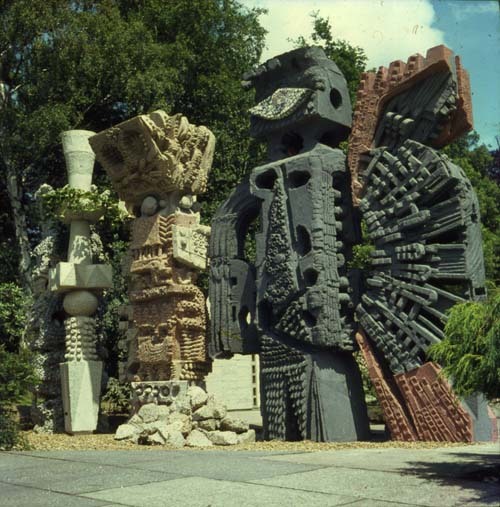 As much of his work was carried out during the 1960’s and 70’s, cement and concrete were common materials, but Mitchell approached their use in unusual ways, such as casting and carving it whilst still in a wet state. A wonderful example of this technique (using Faircrete) are the Stations of the Cross at Bristol Cathedral, one of which “Crucified” is shown being carved by Mitchell above. 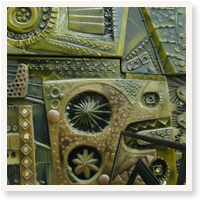 Other innovative techniques and materials included the use of recycled timber and furniture to create mosaics, the use of recycled glass, melted down and recast and textured to form new strips; inlaid chipboard, etched glass and GRP (Glass reinforced plastic) and GRC (Glass reinforced concrete), and the use of resin and polyurethane, images of which are shown below. Stylistically, Mitchell’s work seems to me to have deep roots in an almost folk tradition, harking back to more pagan and unruly times; the bold, geometric shapes, the rich use of textures bringing to mind rocks and the earth and an overwhelmingly strong belief in craftsmanship, all seem to suggest a man who was probably happy just to be commissioned to make his art and get it out into the public domain, rather than any selfish or considered act of trying to make a name for himself in the more accepted art circles. Truly a man with a sharply focused social conscious, and as he himself states on his website “Some of the projects I did were good, some were reasonable and most were controversial – none, however, broke the bank. These were the products of an exciting time, and one that I don’t think we shall see again. It was great to be part of it”. 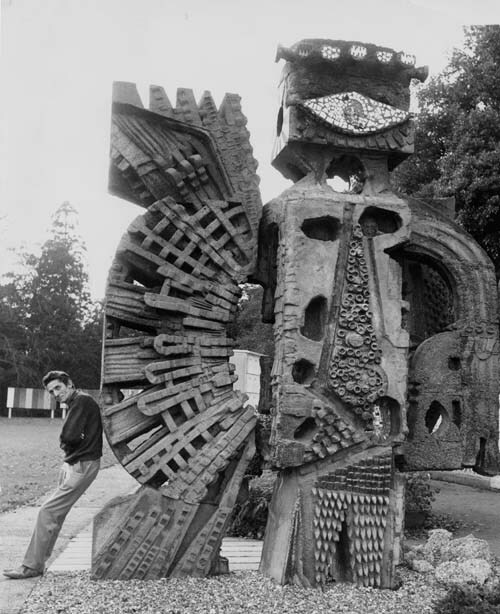 Despite seemingly little “academic” recognition, Mitchell’s public sculpture during the 60’s and 70’s was radical, experimental, considered, generally beautifully made and hugely popular with the people who saw it every day, and although I suspect few people knew his name, many people will have enjoyed his highly theatrical and accomplished work. Tastes change however and I fear that during the 80’s/90’s & 00’s, people will have seen his work as out of step with the times: too random or haphazard maybe, too dense, all in all too “concretey” and as such, I suspect that there are many of Mitchells works that have been quietly destroyed along with the buildings or urban spaces they inhabited. 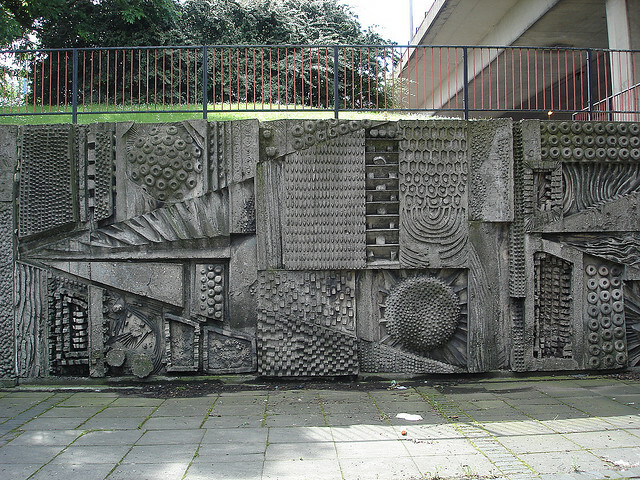 Thankfully this is starting to change now and a wider appreciation of concrete sculpture and murals is steadily growing. 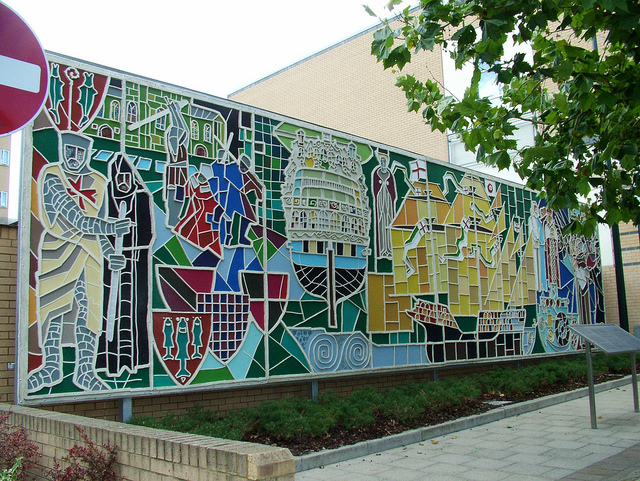 The Twentieth Century Society’s Mural Campaign is a case in point, as the opening lines of the above site state categorically that.. “Post War murals are an endangered species. Although paintings and sculpture from this same period are seen as fit subjects for gallery display and academic study, murals – often by the very same artists are still frequently ignored and often destroyed”. Indeed it is very hard to ascertain with any degree of certainty using the web, how many of Mitchells’ works still exist, and even though there is frustratingly little regarding Mitchell on the web (other than his own site, where I acknowledge that much of the info and images in this post have come from), it’s obvious that he was a staggeringly prolific artist. 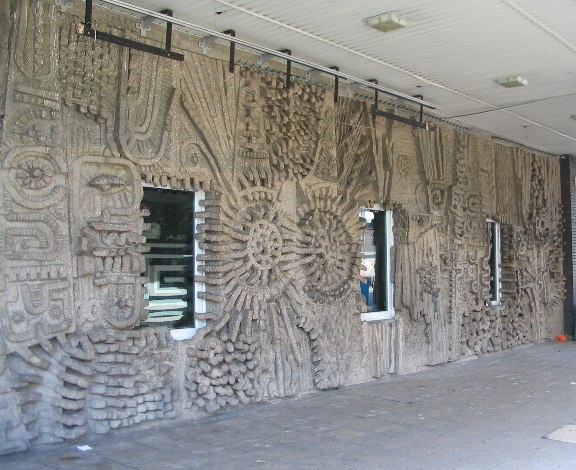 His work for the LCC alone must have involved possibly 100’s of commissions, including decorative wall panels, community centre murals, free standing play features, subway decorations and large scale concrete decorative cladding panels to name just a few. 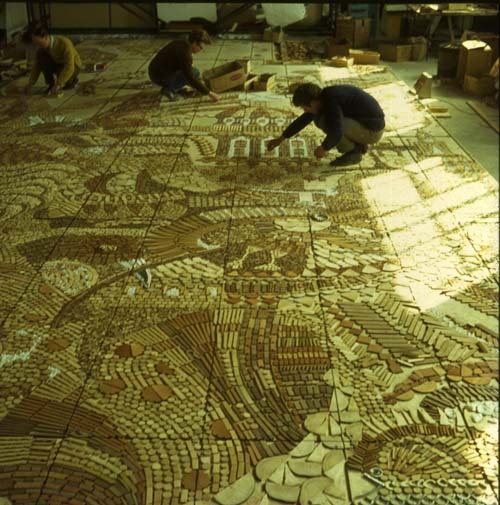 He also completed some major installations in Harlow, Wrexham, Manchester and Liverpool as well as what looks like some significant overseas commissions. 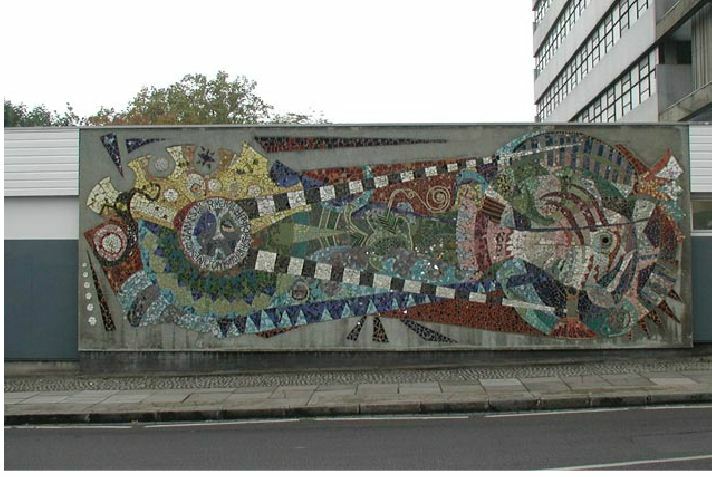 Some of his work has recently been recognised and consequently listed; The Three Tuns Mural in my home City of Coventry and the Islington Green School murals are just 2 examples. Hopefully more will follow, as the art world finally wakes up to a criminally overlooked and disregarded aspect of our social and artistic heritage. 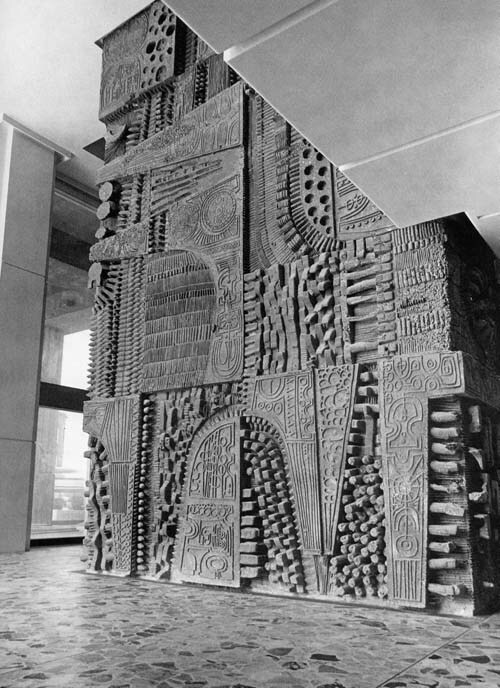 If you’re interested, there is a good article here that refers to William Mitchell’s murals, and why they are so worth saving. In the interim, here is a small selection of his amazing work. Admiring the dedication you put into your internet site and detailed data you present. Its great to come across a blog every once in a while that isnt the same old rehashed facts. Superb read! Ive saved your web page and Im including your RSS feeds to my Google account. Hello, I came across your blog and really like it. Especially this post. There are a few photos in it I haven’t seen before as well. 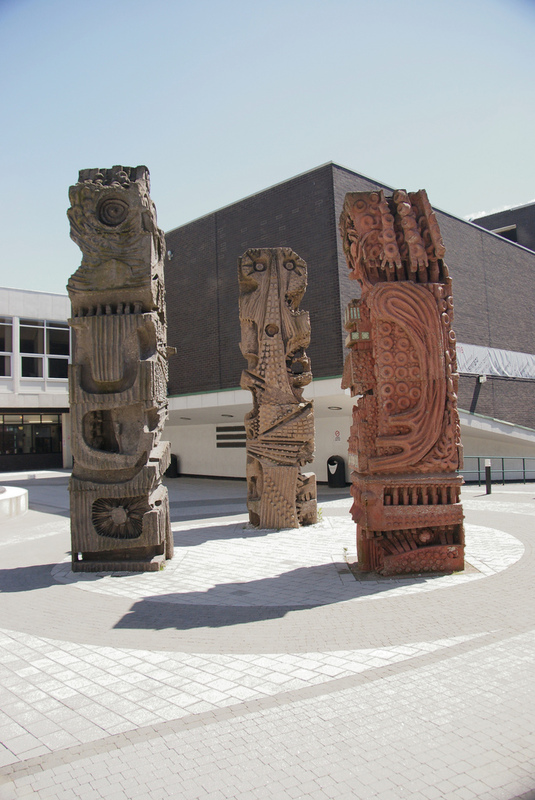 I’m really interested in public art and town planning, and have become a bit obsessed with the work of Mitchell over the past year or so! I travelled to London to interview him in July for a Manchester-based magazine called the Modernist, which focuses on art and design, primarily in the north west of England. It was such an experience meeting him – like you said, he is a racounteur! I put a slightly longer version of my interview on my blog as well, as I cpouldn’t fit all I wanted to say into the 1,000 word limit of the magazine article! 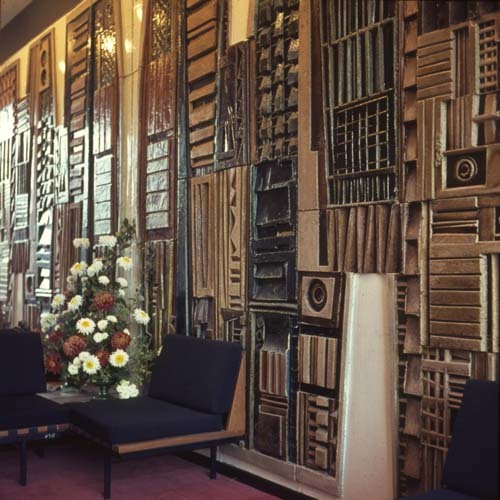 Enjoyed the stuff on Coventry Cathedral too – I’m pretty desperate to visit! I have submitted a listed building app. 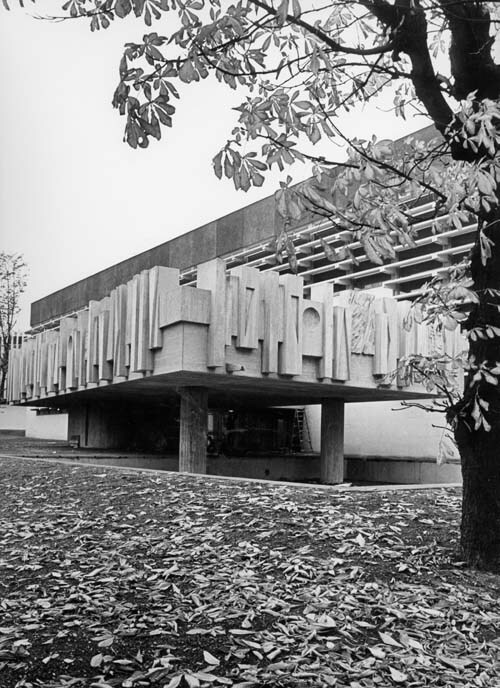 for a threatened 1960’s office block in Shirley Solihull. It has according to 20th Century Soc. a wonderful mural by Mitchell. Trouble an application was made in 2011 and turned down so the Society have told me its not likely to get listed status. I want them to get behind my application and try again! Thanks for this! I am researching William Mitchell’s work for a project of mine related to BART in the San Francisco Bay Area. His sculptures are in quite a few train stations and they’re great! I’m working them into a game I’m writing. The Vorticists @ Tate Britain Frank Whittle & the first British jet planes.